In which country to do women give men chocolate on Valentines Day? 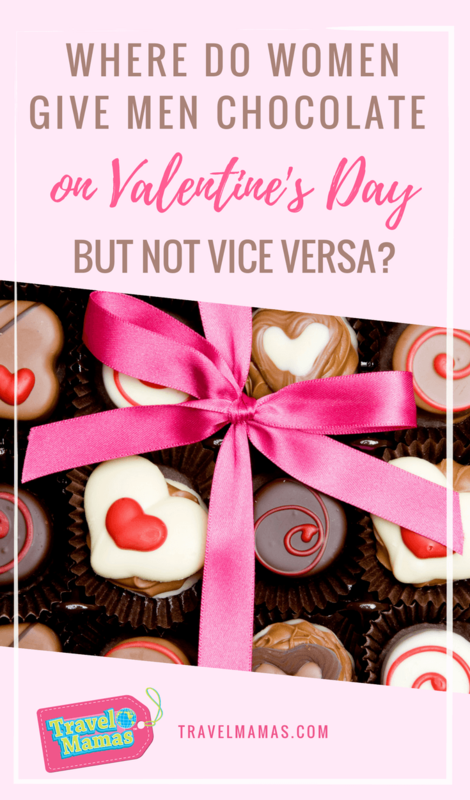 In which country do women give men chocolate on Valentines Day (and not vice versa)? Women give men chocolate on Valentines Day in e) Japan. In this Asian country, Valentine’s Day is all about women purchasing the right amount and quality of chocolate for their husbands, boyfriends, and even male coworkers. There are two types of chocolates given to men in Japan on February 14. One is honmei-choco, which is prospective winner, or lovers’ chocolate. The other is giri-choco, which is obligation chocolate for platonic recipients. Men don’t have to return the favor until a month later, on March 14, or White Day. Men are expected to give gifts at least doubly as valuable to women on this “reply day.” White Day was originally launched by a marshmallow manufacturer, which tried to convince men to give these puffy white confections to women. Now, in addition to marshmallows, men give white chocolates, white lingerie, and jewelry or other gifts in white packaging to women on March 14. Ahh…marketing genius! Need chocolates with same-day delivery? Check out all the sweet goodies at Godiva that can be hand-delivered today! Before you go, check out this list of romantic comedies set in London to watch with your honey (or your gal pals). Want to plan a romantic retreat with your partner? Take a look at our suggested romantic getaway destinations. Do you think women should give men chocolate on Valentine’s Day? Let us know your favorite Valentine’s Day gift ideas in the comments below! All I can say is I’m glad I don’t live in Japan. There’s no way I’d want to deal with two Valentines Day, even if one was all about me getting treats. This is another way to get your favorite chocolates in the house. Who knows what will happen to them? This is a new thing that I know from your blog thank you for sharing. Home » BLOG » In which country do women give men chocolate (not vice versa) on Valentines Day?